The Tartan 4000 design embodies all of the recent Tartan leading technologies and advanced performance cruising conveniences. She is equipped with our CCR (Cruise Control Rig), carbon fiber mast, boom and rudder, infused BPA epoxy composite hull and deck and all-lead low center of gravity bulb keels. 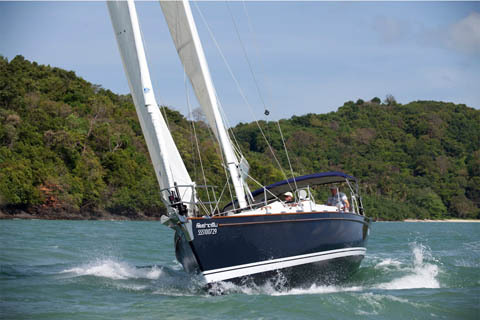 As the only vessel to be awarded a double-headed win by Cruising World andSailing World, the Tartan 4000 is the clear choice for discerning sailors. Delivering sensational sailing performance, the 4000 was noted by Cruising World Boat of The Year judges as stiff, fast, weatherly and fun. The boat’s high-tech construction is evident in the infused epoxy / composite hull and deck and in the carbon fiber mast, boom and rudder. These advanced construction techniques offer superior longevity and a more stable and safe sailing vessel. The truly versatile design will shine during coastal cruising and offshore voyaging, as well as competitive club or distance racing. 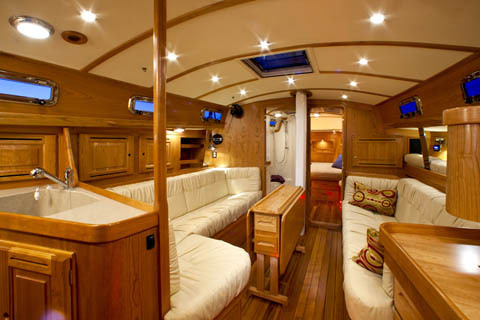 Our vacuum infused hull laminate is done in a single process with all components in place rather than bonding each layer separately like other builders. This produces a singular primary bond among the laminate components rather than the weaker multiple secondary bonds between cured laminate layers produced by traditional polyester construction. This process consolidates the laminate into a void free matrix and produces the optimum strength to weight ratio in a composite laminate. This is critical factor in determining both the speed and stability of the yacht when it leaves the dock. 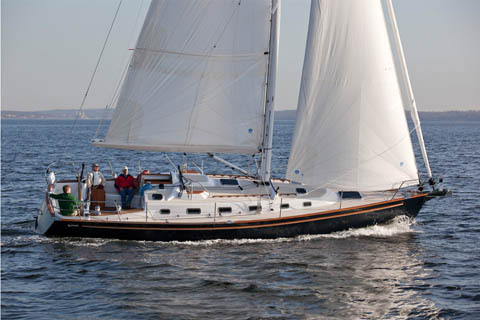 Tartan Yachts is one of the only sailboat manufacturers to offer carbon masts and carbon pocket booms standard. Carbon fiber exhibits a tensile strength greater than that of steel. As a result, our carbon masts have a substantially greater section modulus than their aluminum counterparts. This superior strength means greater safety at sea. Displacement: 19604 lbs./ 8892 kgs. Ballast: 6400 lbs. / 2903 kgs. Water: 100 gals. / 378 ltrs. Fuel: 50 gals. / 189 ltrs.